10 water melon fact that is breath taking... Lolz. Watermelon, also known as Citrullus lanatus is a plant species in the family Cucurbitaceae with smooth green skin, pulp, and watery juice. The vine-like flowering plant is a nutrient dense food with contains a high amount of vitamins, minerals and antioxidants for a low amount of calories. Here are some facts about watermelon that might surprise you. There are more than 1200 varieties of watermelon that come in various weights, shapes, sizes and colours. The colours are; Red, orange, yellow and white. Key commercial varieties of watermelon include the Carolina Cross, Yellow Crimson, Orangeglo, Moon & Stars, Cream of Saskatchewan, Melitopolski, and Densuke. Watermelon is a fruit and a vegetable too. It is a vegetable because it is a member of the same family as the cucumber, pumpkin and squash. It is also harvested and cleared from fields like other vine growing vegetables. You can eat watermelon rind and seeds. All parts of a watermelon can be eaten, even the rind, which actually contains a number of nutrients too, but due to the unappealing flavour, it is rarely eaten. In China, the rind is used as a vegetable and stir-fried, stewed or pickled. Try putting it in a blender with some lime for a healthy, refreshing treat. Not only does the rind contain plenty of health-promoting and blood-building chlorophyll, but the rind also contains more of the amino acid citrulline than the pink flesh. Same goes for the seeds; you can just consume them as snacks in between your meals. Nutritionally, watermelons contain high levels of vitamin B6 (which increases brain power), vitamin A (good for eyesight), potassium (which helps in curing heart disease and keeping the heart healthy). 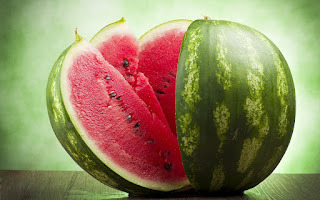 The watermelon also contains Vitamin B1, C and manganese which protect against infections. By weight, a watermelon contains about 6% sugar and 92% water. The high water and electrolyte content of watermelons make them ideal as a refreshing summer thrust quenchers. They keep us hydrated, our skin fresh, and can clean the kidneys of toxins. Watermelon and watermelon juice have been shown to reduce muscle soreness and improve recovery time following exercise in athletes. Researchers believe this is likely to do with the amino acid L-citrulline contained in watermelon.